People in DC do some crazy things in the winter, see the picture above of a car parked in the building behind my apartment building, with its windshield wipers propped up in the air, allegedly to prevent the wipers from freezing on the windshield when it snows. I wrote about this last winter, see the post and picture here, I am still not at all convinced that this is an effective method to deal with winter snow. And it hasn't even really snowed yet in DC this winter, and yet I have seen many cars like this one, with the windshield wipers up in the air. I have also seen numerous people in the last few weeks walking around in shorts, even when the weather has been quite frigid, and I saw the same thing in Michigan in December. When I was in Russia in 1990, taxi drivers stored their wiper blades in the trunk of the cab when not driving in the rain. 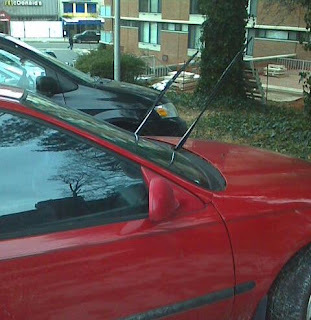 This wasn't, of course, to prevent the wiper blades from sticking to the windshield. It was to prevent theft of the wiper blades. If the blade of the wiper is not frozen to the window, you are not going to damage it when you are hacking away at the ice that has practically melded to your window. From one who has seen all the different ways ice can freeze to one's window, it is clearly the better part of prudence to get one's windshield wipers free of the window before a major storm. However, if you see people doing this south of New Jersey, they are posers. Hello, my name is Angela and I am a wiper raiser....I do it because hacking the ice off the window is easier if the wipers aren't in the way. As someone who just wrecked a set of wipers by not doing that or otherwise making sure they were free before taking off in ice rain, I'm getting a kick out of this post. I'm with Jack and HD Jim. Doing this helps prevent wrecking the wipers. I don't do it, because it is so seldom an issue. You need a hard freeze and a good coating of ice to make this a rational precaustion. What is really irrational is even wanting to drive while there is ice around. Adding to reasons to stand up wiper blades, after I commute to work the engine has enough heat in it to melt snow. Then at 5 when I'm heading home and want to get the mist from the truck in front of me of the windshield, the wipers are stuck. I would have to drive for quite a while to get enough heat under the hood to start breaking down the ice. If you try to start your wipers when the blades are frozen to the windshield you risk damaging not only the wiper blades but also the windshield wiper motor. For that reason some cars are now including defrosting / ice melting heating elements in the windshield where the wipers are stowed. I wonder if -- as an economist -- you might view this as an informational arbitrage: you are new to this weird practice that everyone else knows about. Maybe you should practice it too? In Fairfax Country near GMU, I was glad to have pointy windscreen wipers this morning! I'd be concerned about the people who do it in their garage. UCLA Commerce Index Hits 30-Month High in Dec.